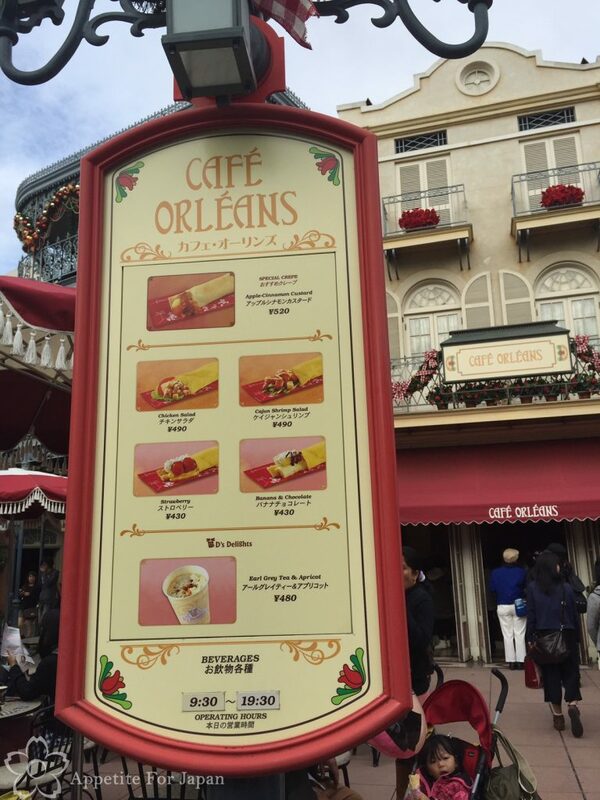 Café Orléans is one of 28 counter-service restaurants and cafes at Tokyo Disneyland. This is where you’ll find sweet and savoury crepes. As the name suggests, Café Orléans is meant to be a New Orleans cafe. Without having been to New Orleans, I can’t comment on how realistic it is, but I can say that this counter-service cafe has nice outdoor seating in a nice part of the park. 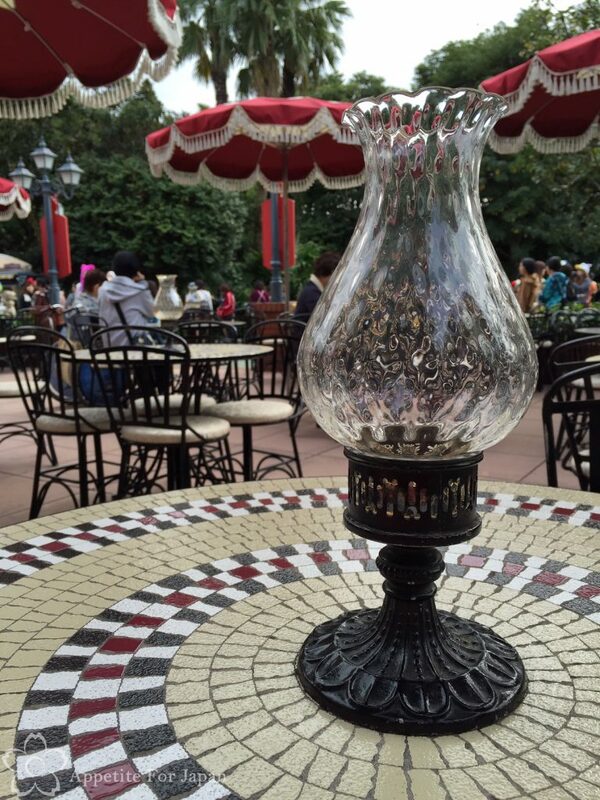 It’s all about the detail at Tokyo Disney Resort, and if you look closely at the lamp in the above photo, you’ll see the little Mickey Mouse patterns in the stand. 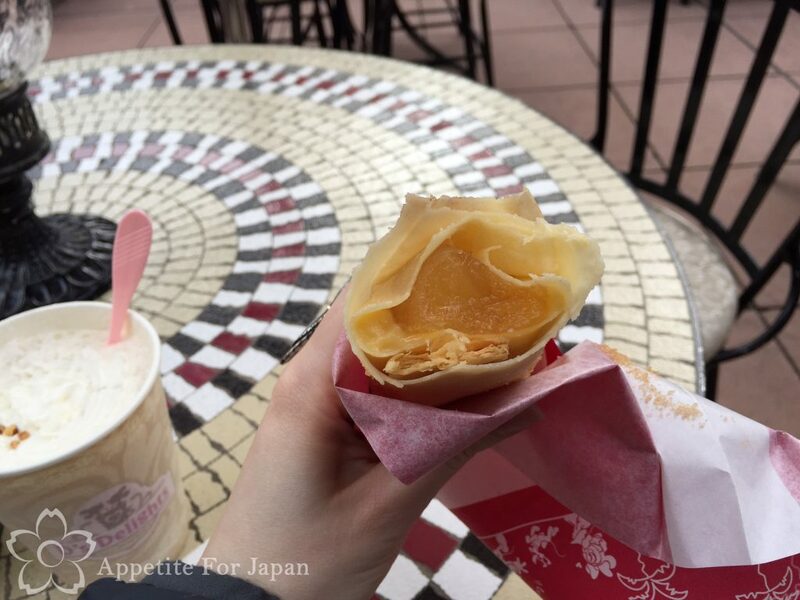 My partner and I are huge fans of Japanese crepes, so we visited Café Orleans to try their crepes. They’re not the same as the Japanese crepes that you’ll find around Harajuku, but they were okay and made a good snack (or in our case, breakfast). Above: I had the seasonal special, which at the time was the apple-cinnamon custard crepe (520 Yen), and my partner had the strawberry crepe (430 Yen). 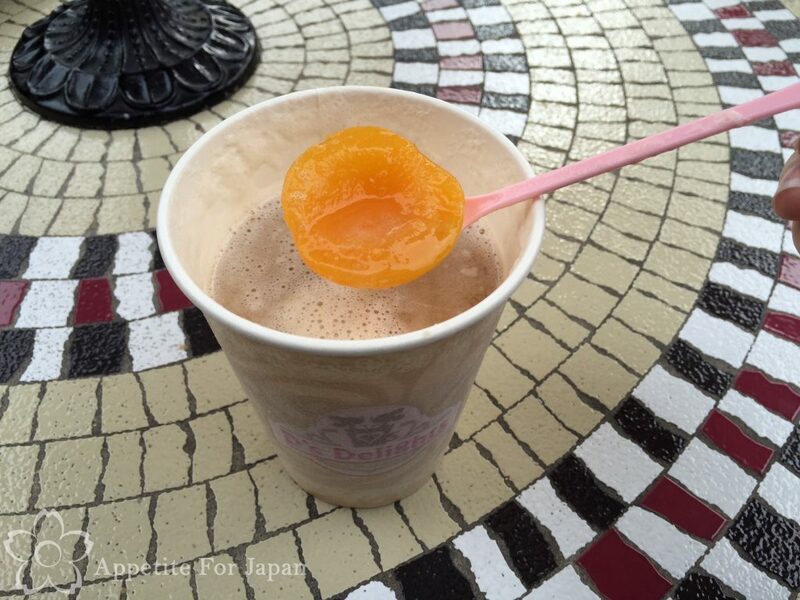 We also tried the Earl Grey tea & apricot (480 Yen). This is not your average cup of tea. It had cream and chopped nuts on top, and pieces of tinned apricot in it. I think this would have made a great chilled drink, but it only comes in a hot version. Above: I wasn’t joking about the tinned apricot in my tea! Above: A sample of the menu for Café Orléans. 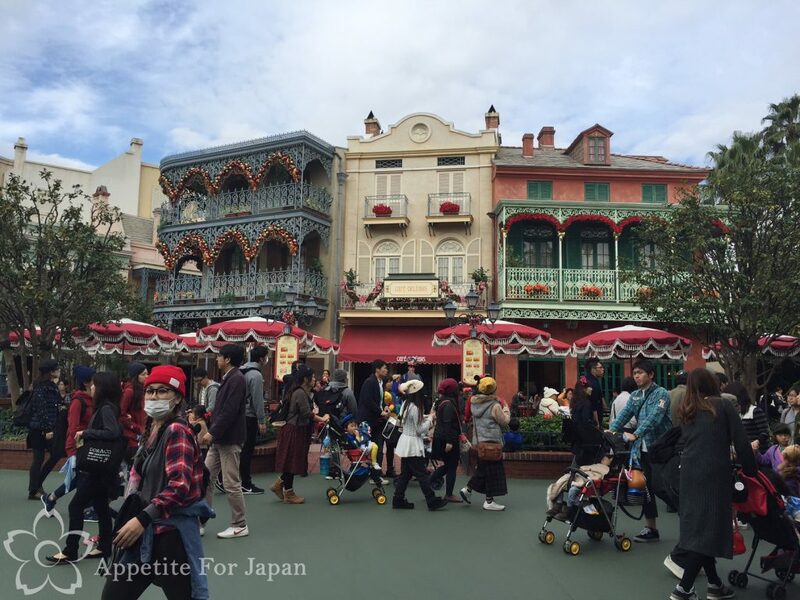 Note that the menus at Tokyo Disneyland are subject to change, particularly the seasonal specials and the D’s Delights drinks. 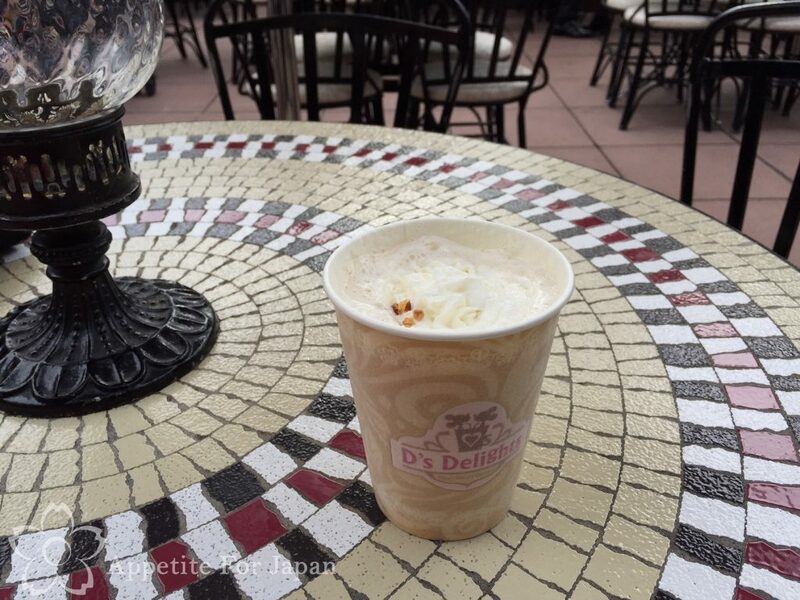 Café Orléans is in the New Orleans area within Adventureland (turn left as you exit the undercover part of World Bazaar, and walk until you see the New Orleans-styled streets), not far from the Blue Bayou, near the Pirates of the Caribbean ride. Would I recommend Café Orleans? 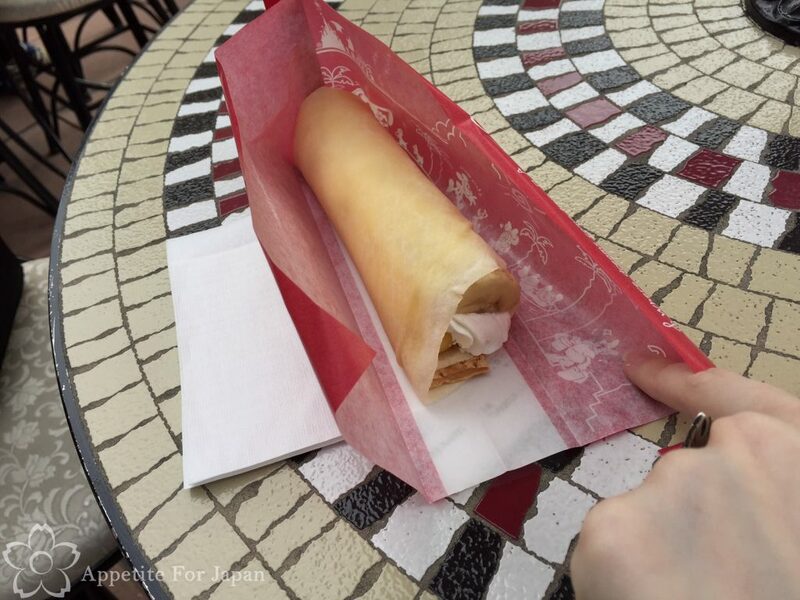 Café Orléans is a decent place to sit down and enjoy a snack-sized crepe in good weather. It tends to be less crowded than the Great American Waffle Company (which is where you can get those famous Mickey Mouse waffles), probably because it is less popular. I wouldn’t call these a must-eat, but there was absolutely nothing wrong with them either. 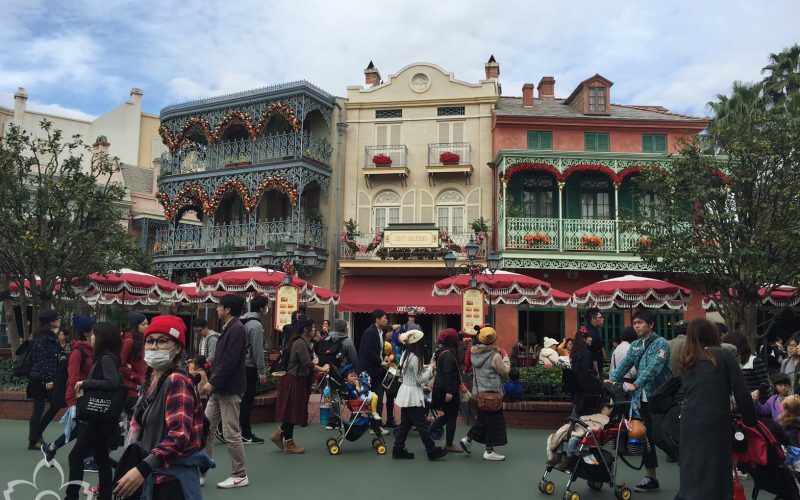 Café Orléans is generally only open until the early evening, so bear this in mind if you’re keen to get eat crepes at Tokyo Disneyland.